Halloween is less than a week away. It’s the time of year when Christians come out on various social media outlets to shame people who fully embrace celebrating Halloween or shame those that turn the porch light off and ignore what’s going on all around them on October 31. Some find a middle ground between the two but it’s very clear Halloween isn’t your typical holiday for Christians. I could bore you with the historical background both Christian and secular, but that’s not my point here. As a parent of two candy loving kids, I have to use some discernment and……gasp, the Bible, to help inform how I might lead my family during this holiday. As I reflect back on my own childhood, Halloween was an occasional Fall Festival dressed as Mickey Mouse. I don’t recall trick or treating much as a child. Halloween just wasn’t a big deal in our home. I don’t even think Halloween decorations, decorative lights etc., even existed when I was a child. For some of you Pinterest loving, Halloween super enthusiasts you’ve already broke out in hives but stick with me here. Last year I sat in my driveway with my Mario carved pumpkin sitting next to me, while my wife took our 2 kids out trick or treating. I had the opportunity to talk with neighbors and hand out candy to the kids in all different positive and negative costumes. 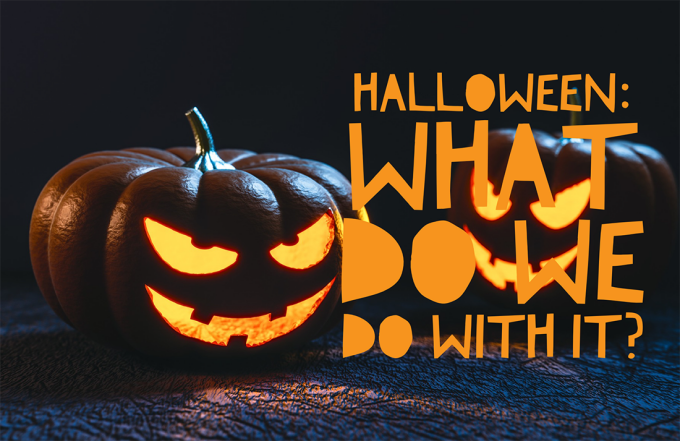 Halloween is worth our consideration, it’s worth our time to question what it’s all about, to question how we as Christians should interact with it and how we might use it to open up opportunities for the gospel. So without further ado, here are some verses worth your consideration as you pray and prepare for October 31. Let’s agree on this first; however you approach Halloween, as a believer it can’t be like the rest of the world. We cannot conform to the world. That’s not a Halloween principle, that’s a life principle. If you want to do God’s will for Halloween, be transformed, not conformed. So let me ask you a question, does the way you celebrate Halloween look differently than the way your neighbors celebrate the holiday? Look at that, we stumbled upon something that says we should be doing exactly what we’re doing now, examining Halloween carefully. Two principles here….hold fast, or tightly, to what is good and abstain from all evil. I’ll refrain from quoting every verse that speaks to witchcraft, sorcery, demons, summoning the dead etc. All the Halloween haters have already memorized and quoted those verses to you so you feel bad. Here’s a question though….in your celebration of Halloween, are you abstaining from all forms of evil and holding tightly to good? Haunted houses, creepy clowns, death…it is all intended to create fear. Fear is not a God honoring attribute, unless it is the fear of the Lord, but that’s a different kind of fear all together. Fear and love are contrasted here in a passage that speaks to how God is love. In your celebration of Halloween, do you cast out fear through your love of those around you? So whether you eat candy, drink hot cider, or whatever costume you wear, do all to the glory of God. Not exactly a direct quote but the principle holds true. I hope you’re getting this, the question of how to celebrate Halloween isn’t a Halloween issue, it’s a how do we live like Christ issue. With that in mind, as you celebrate Halloween, are you bringing glory to God in EVERYTHING you do? And as he reclined at table in his house, many tax collectors and sinners were reclining with Jesus and his disciples, for there were many who followed him. And the scribes of the Pharisees, when they saw that he was eating with sinners and tax collectors, said to his disciples, “Why does he eat with tax collectors and sinners?” And when Jesus heard it, he said to them, “Those who are well have no need of a physician, but those who are sick. I came not to call the righteous, but sinners. This story caught the self-righteous Pharisees off guard and truth be told could catch some of us off guard today. Jesus was in and amongst sinners; seriously sinners! Guess who comes out of their houses on Halloween…..sinners. Yes that’s right, all those people you never speak to come outside and go door to door interacting with one another. Here’s a question, is there anything about Halloween, like eating with sinners in the story above, that isn’t clearly wrong? If so, in your celebration of Halloween are you helping the sick, not the ones with the fall sniffles/allergies, the ones that need to know Jesus? The list could go on and on and reflection on the holiday could go on and on. As you consider Halloween, consider your whole life. There is nothing on this list you shouldn’t be considering each and every day of your life. Halloween is no different than any other day; we’re on a sinful planet, surrounded by sinful people, doing sinful things. Maybe we should stop shaming other believers in regards to our Halloween opinions, consider the Scriptures, and do something that brings glory to God! I’ve been thinking about this quite a bit over the last several weeks and have hoped that these truths from the Scripture might encourage you and help you in the days to come. 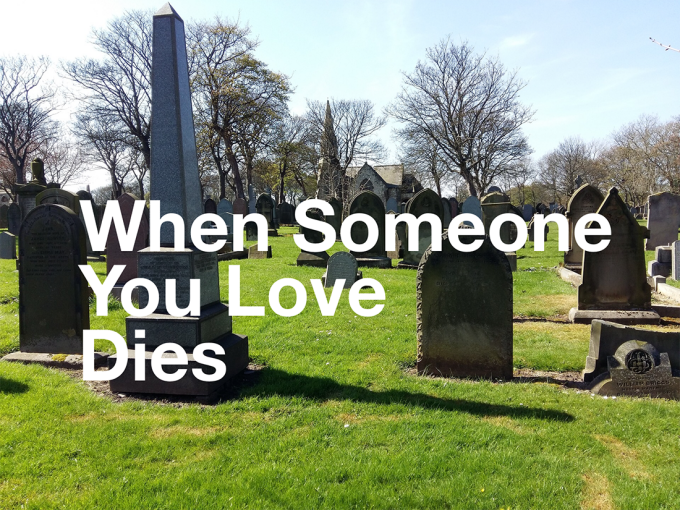 As disciples of Christ one of the most difficult trials that we find ourselves confronted with along our journey of life is the loss of someone we care about and love. The depth of the emotions that we experience and the grief that we encounter at times can be just a little bit overwhelming. In addition, we discover that there are a myriad of adjustments that will occur. They seem to begin almost immediately with the simple changes that happen within our daily lives, and then quite unexpectedly they continue to expand to new and unanticipated changes which are uncovered day by day. We grieve... and the deep and personal emotion that we experience during these times of grieving turn out to be gifts from God to us because they reveal the depth of love that we can share and have shared with another and they draw us closer to Him. The revelation of the Scripture never instructs us not to grieve. What they do say is that if a Christian dies, we do not grieve as those who have no hope. We have hope because we know, not just wish, that our separation from our loved ones is only temporary. It most certainly is a powerful revelation to know that the ones we have loved and cared about are now in heaven with the Great Shepherd, Jesus, who has taken them through “the valley of the shadow of death” into the presence and fellowship of the Father along with those who have preceded them. We have hope for the future and yet we still need help for the day. It is at times like this we find common ground with all humanity, for we all need the same things...comfort, rest, hope, strength and peace...and all of those things are found in Jesus. We have a heavenly Father who understands the sorrow that we have when we lose someone we love. He knows what it’s like to lose a loved one...a Son... on the cross... dying for the sins of the world. We have a Helper, the Holy Spirit, who brings the comfort of Christ into our lives. That really means a lot to all of us...in real life...with real stuff going on. He offers us comfort and He offers us rest and He offers us peace. It’s just so true that Christ makes such a discernable difference in our lives; in the way we live, in the way we think, and in the way we heal. We just couldn’t do it without Him. Our hearts are comforted, and our lives are motivated, to not only receive His blessing but to share it with others who long for and have need of the same inner peace that brings such indescribable joy. It may be that right now you’re not experiencing the loss of someone in your life, but the time will come if the Lord tarries. And when that time comes in your life or in the life of a friend, you will have an opportunity to receive what the world cannot give. The “peace that passes understanding”. People will try to help one another...and they should...and that is good...but it’s not enough...we need more...and only Christ is sufficient. When someone we love dies, the same offer that was given by Jesus many years ago still holds true. It is a promise to be claimed and experienced. May the Lord be lifted up and glorified.